HOLY COW! I HAVE 60 FOLLOWERS! | Who Are You Calling Crafty? HOLY COW! I HAVE 60 FOLLOWERS! Image me saying that in a bad Harry Carey voice (I apologize if you do not know who Harry Carey is). Well I have 60 Followers and I am extremely grateful for each one of you. My husband thinks I have gone a little crazy and I know he is working on a guest post so maybe in the next couple of weeks he will post something. Well I have a very busy weekend getting ready for my little man’s birthday party, so I might not be posting that much this weekend, but I should have amble time on Monday to recap the weekend and cake building. 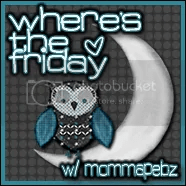 It is Friday so Happy Blog Hop Day! Thank you again for taking the time to stop bye and follow my crazy little bog!